The unique Rimba Raya REDD+ project is the largest initiative to protect and preserve High Conservation Value (HCV), lowland peat swamp forests on Borneo – one of the world’s most endangered ecosystems. The tropical peat swamp forests of Rimba Raya give home to almost 1,000 species of trees and plants. Forests of this type are among the world’s largest repositories of carbon; when slashed, burned and drained, they become huge sources of greenhouse gas emissions. Once designated for destruction and conversion into a palm oil plantation, the Rimba Raya forests today are dedicated for the long-term protection and preservation of precious habitat of hundreds of at risk species – most notably, the endangered Bornean Orangutan whose population has declined over 95% in the last century. In order to empower the local population to live in harmony with their forests, the project owners also set up several programs to offer alternatives to illegal logging. A multitude of jobs have been created within the project scope that enable locals to earn a living in forest patrol and forest survey teams, respectively. 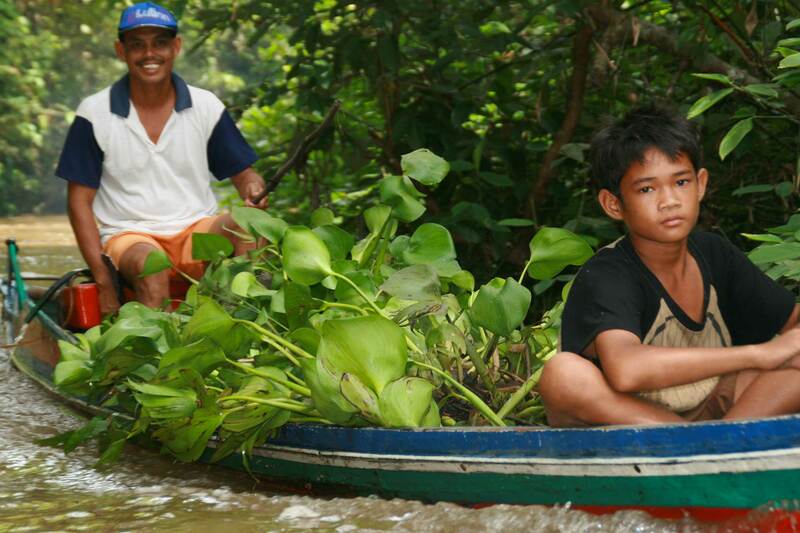 Reforestation efforts in the so called “jungle rubber” model have been undertaken in formerly degraded project areas. This allows for sustainable forest use by the communities in a mixed species, natural forest environment with harvest of rubber, fruits, and essential oils. In a further attempt to strengthen the local communities, the project owner is distributing low maintenance, ceramic water filters and highly fuel-efficient cooking stoves to all households in the project area. By this, water borne and indoor smoke related diseases as well as firewood demand (for boiling off water and cooking) are drastically reduced. Also supported are two medical aid initiatives for local communities. Many locals found work in the project, with positions in, among others, forest patrol & survey teams, forest fire brigades, and as guard posts, fire tower construction workers, guides, and boat pilots. After a successfully conducted test phase in 100 households, a low maintenance, ceramic water filter is being distributed to each and every of the about 2500 households in the project area. These filters are coated with colloidal silver, which kills 99.98% of pathogens from unsanitary water, eradicating water borne diseases. In a similarly structured program, after a successful pilot phase, highly efficient cooking stoves are given to all households to mitigate indoor air pollution with its associated health impacts. To foster sustainable forest use, “Jelutung” (jungle rubber), fruit trees and Gembor (a tree with bark that yields a valuable essential oil) are planted in a mixed species structure for natural forest regeneration on degraded land. Affordable healthcare services are made possible through financial support to Health in Harmony and Alam Sehat Lestari (ASRI) which offer health care at low or even no cost to the local communities. The project is dedicated to safeguarding one of the last habitats left on earth for our close relative, the orangutan. For this, a partnership with the neighbouring Camp Leakey Research Center has been set up. The project also funds the Orangutan Foundation International and their Orangutan Care Center, which aims to reintroduce 300 wild born, rehabilitated orphaned orangutans in its care, back into the wild within the safe confines of the Rimba Raya Reserve. The project protects a unique mixture of mangrove and tidal/ brackish water swamps, marshy, grass-dominated wetlands, riparian and freshwater swamp forest, peat swamp forest, kerangas (heath) vegetation, and lowland mixed dipterocarp forest on mineral soils. Apart from the huge climate benefits, the project is saving the forest’s rich biodiversity with its 300 species of birds, 122 species of mammals, and 180 species of trees and plants. Through the long term protection of the forest, its function as important watershed of the Seruyan River is secured too. The project is located west of the Seruyan River at the southern coast of the island of Borneo, in the Indonesian province of Inner Kalimantan. The project area’s massive 64,000 hectares also serve as a buffer zone to the Tanjung Puting National Park, home of the renowned Camp Leaky Orangutan Research Center. Rimba Raya means “The Infinite Forest” in local language.